Choosing a solar installer can be the most challenging part of your solar buying process. While solar equipment can be classified by product specification, and financing options have costs and benefits that can be calculated and compared with consistent assumptions, solar company reviews with standard metrics are difficult to find. The good news is that there are plenty of solar installers out there with well-trained and experienced staff. Solicit multiple quotes from pre-screened solar installers at no cost in the EnergySage Solar Marketplace to find local companies active in your area. Then, use the following tips to understand how to choose a solar installer. Your installer should have expertise in installing solar energy systems. The gold standard is the North American Board of Certified Energy Practitioners’ (NABCEP’s) Solar PV Installation Professional Certification. Solar companies should have a NABCEP-certified professional provide quality assurance for every system that the company installs, and ideally, there should be a NABCEP-certified professional on every crew. Some installers who have been working in the solar industry since before NABCEP was formed in 2002 may not be certified. However, given the success of NABCEP, installers without the certification will need to demonstrate that they have significant expertise. Check solar company reviews especially for those without this certification. Solar installers should have all necessary business licenses and insurance policies, which vary by state and occasionally local jurisdiction. Typical business licenses for solar installers include general contracting, electrician, home improvement, or home performance contracting licenses. At a minimum, installers should also have general liability insurance. Solar is a growing industry that attracts professionals from many backgrounds. Contractors that once focused on other types of projects are extending their practice into solar installation. When conducting solar reviews, make sure your installer has an established solar track record. A solar provider should be able to discuss and show you systems installed for previous clients. Solar company reviews from past customers are great for evaluating installers, but they can be misleading. Customers providing ratings and reviews are unlikely to be a representative sample relevant to you. However, ratings and reviews can provide a check on bad behavior – a pattern of customer complaints is probably an indication that you should work with a different installer. EnergySage has done the work of reviewing installers for you. 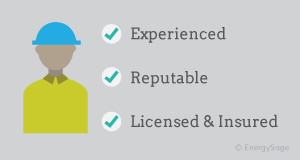 All of the installers in the EnergySage Solar Marketplace are pre-screened for technical expertise, licenses and insurance, industry experience, market reputation, and commitment to the solar industry. Workmanship warranties are specific to the work of designing and constructing the solar energy system, and generally range from 1 to 10 years. While you can sometimes purchase a separate contract for the operation and maintenance of your solar panel system, in most cases, it is better to pay for an installation from a qualified installer with a solid workmanship warranty. Solar installers sometimes rely on sub-contractors to perform specific tasks during an installation. The best installers are transparent about how and why they use sub-contractors, and they use effective oversight whenever sub-contractors are involved. When a sub-contractor brings a particular expertise or has a longstanding relationship with the installer, these arrangements can work quite well. Be wary of any solar company that sub-contracts all of its work or presents you with a contract from a company with a different name. It is important to know who exactly will be standing behind your installation. Going solar is a significant investment in your home, and you should have a strong, trusting relationship with your installer. The best installers will work with you to understand how solar fits within the energy system of your home or business. Moreover, superior installers are guides and advisors. Your solar installer should be someone that that you want to do business with, as well as a professional with the competence that you expect.